Welcome Our New Welcome Email! It's Monday: you're busy, we're busy, everybody's busy. But, if you have a moment, we wanted to tell you about an exciting project we've been working on and for once we're not talking about your new profile. We're talking emails, specifically the 'Welcome Email' that we send to every client after they submit their gig request. You've probably never seen this email but, trust me, it's an important one. We send it out hundreds of times a day, sometimes thousands. This email has to clearly explain our booking/bidding process which, admittedly, can be a bit tricky for first-time users. It has to convince the client to hang tight and wait for your bid. 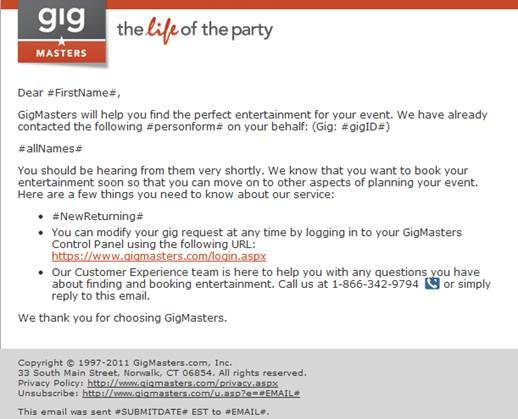 It also has to convey the virtues of booking with GigMasters and, oh yeah, it has to do all this and not be completely boring. No easy task. I’ll spare you from all the minor details but, in addition to explaining the above, we've added event-specific content to this email to help clients with their event planning. This also encourages clients to further engage and familiarize themselves with the site making them more comfortable booking you down the road. There’s a lot more to the new Welcome Email but I promised to be brief so here’s a quick before and after look by way of explanation. Note: These examples have some essential info stripped out. Above is a preview of just one of the Welcome emails by way of example. Note: a list of the members the client is contacting will be displayed in the right sidebar. This email, as you guessed, goes out to clients requesting kids' entertainment. We have different versions for weddings, corporate events, etc. Pretty cool huh? You'll notice that the new email is a whole lot easier on the eyes. It's also more personalized and has some helpful hints in addition to the essential info. Which email would you take the time to read? 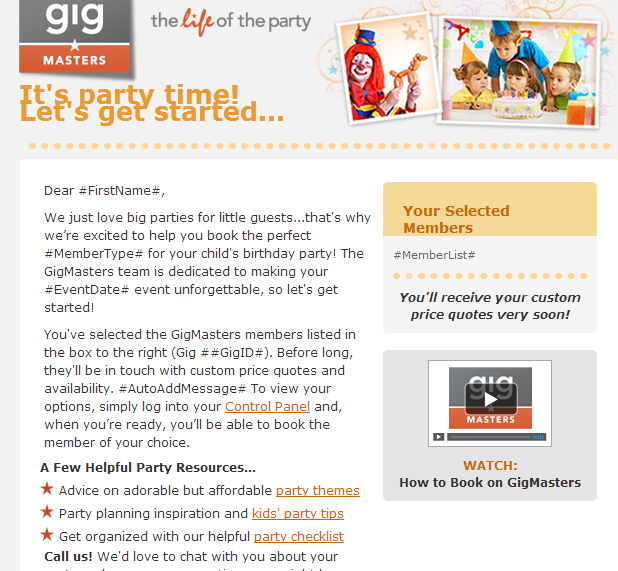 I hope you enjoyed this brief glimpse behind the scenes at what is going on at GigMasters. As always we're hard at work improving our service and, whether we're redesigning profiles or emails, we do it all to bring you more leads and more bookings.